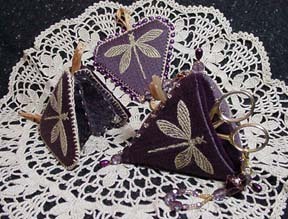 Inspired by vintage needlework accessories, Dragonfly Plum is a coordinated trio. The pyramid pincushion incorporates a pocket to keep fine embroidery scissors handy. A pinwheel and needle book complete the collection and can be hung from the beaded pin atop the cushion. Dragonfly Plum is a beautiful way to highlight a special printed or woven fabric. Consider your own favorite embellishment on any of these components.